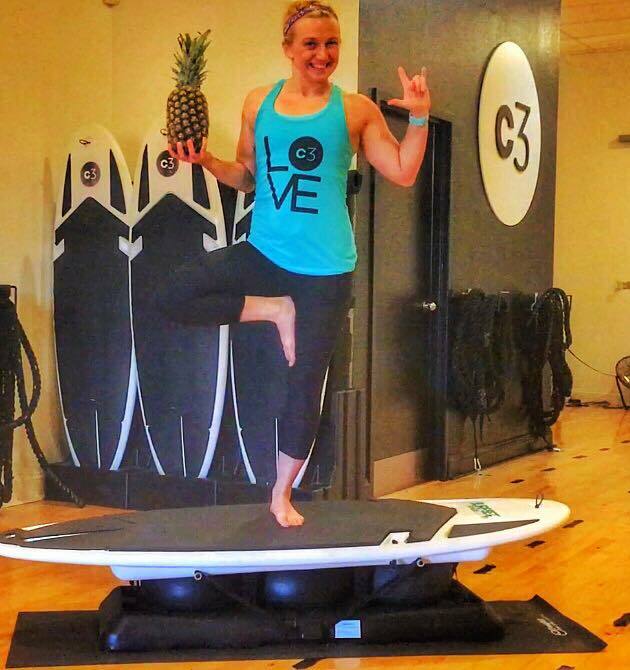 We recently sat down with the always energizing Kaycee Veilleux to learn more about her life and time at Core 3 fitness. Here is what we learned about the amazing Kaycee! 1. How did you get involved with fitness and start teaching at Core 3? I started my fitness career in 2010. I got certified in a cardio dance format thinking it would be fun because I used to coach cheerleading. Not to long after that I got my personal training certification and from then I have attained 13 additional format specific certifications. At the end of May 2018 it will be two years that I have been teaching at Core 3. I currently teach Iron Core, Core 3 Surf and Buti Yoga. 2. Tell us a little bit about your personal life outside of Core 3. I am a wife and a mother of two children. Aside from working at a local wine bar and caring for my family, Fitness is pretty much at the forefront of my life. I teach at another studio as well - equalling 10 classes total per week, but I wouldn’t change it. I always love creating new workouts and seeing people stand up for the challenges I throw at them. 3. Why do you love Buti Yoga and why should others try a class? Buti Yoga. My soulmate workout. It is truly a perfect fusion of strength, cardio, yoga, and BLISS. It is such an empowering practice that once you have given it a go a few times it can be an amazing confidence boost along with providing physical and mental changes. Recently, I collaborated with the other fitness studio I teach at and got the entire 200-hour RYT (Registered Yoga Training) here in St. Louis. It hasn’t been here in over five years and we felt like it was time. I thought that it was going to be hard to fill the training, but it ended up selling out! To help the local Buti community, I will be teaching at the Be Well Bootcamp on June 17, 2018. 4. What is your favorite quote or mantra that you live by? 5. What is your #1 health and fitness tip that you give others who may be struggling or trying to get fit again? You don’t have to be great to start. You have to START to be great. There will NEVER be a perfect time. So why not start NOW!